Serge is a Senior Advisor at Quilvest Private Equity and is responsible for Business Development in the Levant and M.E.N.A. regions and Turkey. Before joining Quilvest, Serge spent over 15 years at Merrill Lynch – Bank of America in Paris acting as a Senior First Vice President, he was in charge of wealth management and fund raising in the Middle East and Turkey and was the initiator of the North African desk. Prior to that and until 1995 , Serge was a Managing Director at Banque Française de l’Orient a subsidiary of Indosuez Bank where he overviewed for more than 11 years the bank’s commercial and international trading activities in the Middle East and Africa. 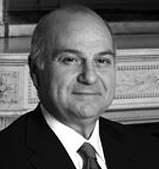 Before shifting to Banking in 1984 , Serge started his career in 1980 as a Managing Partner in a private soft commodity company and acted as a Consultant for several Multinational Companies wishing to establish themselves in the Levant region. Serge is a graduate of the American University of Beirut – Lebanon, he holds a BA in Economics and an MBA in Banking and Finance (with distinction).